Big River, the musical based on Mark Twain's “The Adventures of Huckleberry Finn”, has a storied history. It had a muddied first reception in New York in 1985 but took away a wealth of accolades. The musical had a grand return in 2003 in a celebrated revival produced by Roundabout and Deaf West. And now New York City Center brings it back. And the light shines bright. 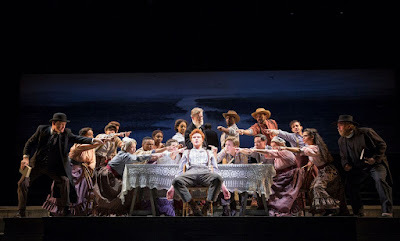 Directed by Lear deBessonet, as part of the Encores series, Big River, in this run. is a simple yet enthralling production with no frills attached. With a book by William Hauptman and music and lyrics by Roger Miller, Big River is the classic story of Huck Finn, a boy looking for an adventure and Jim, a runaway slave looking for freedom. In their journey down the river, they encounter obstacles and detours that open Huck's eyes to the world. This version of Big River, the production let the music soar and the story take center stage while your imagination ran wild. deBessonet's direction was clean and affective, calling out the emotional journeys as best as the text can allow. But if the barometer for success was the exuberance and excellence of the showstopper "Muddy Water," this production wouldn't have lived up to expectations. Yet the overall production was so strong, it's easy to forgive the lack of super power this number ended up having. Despite that, Miller’s score, performed by The Encores! Orchestra, resonated, bringing out a newfound evocative sentiment. Just listen to “Worlds Apart.” It’s bound to hit you profoundly. Through deBessonet’s staging and Josh Rhodes’ choreography, storytelling was the focal point. The piece moved lithely from beat to beat, bringing the audience along for the journey. With the limitation of space, Rhodes was still able to bring some exciting movement into the musical, namely in “The Boys.” The costumes from Jess Goldstein lived in the period but we’ll all be remembering what he put David Pittu in as The Royal Nonesuch. Despite a wealth of credits, Big River was the vehicle that is bound to help make Nicholas Barasch a household name. His journey as the adventurous kid was something special. There’s a beautiful purity to Barasch's voice that makes his Huck almost too perfect. He certainly has some room to find the other flavors within the character, both in personality and voice. As Jim, Kyle Scatliffe’s emotional journey was one for the ages. Though Barasch and Scatliffe may not have had the perfect blend vocally, their bond was genuine on stage. 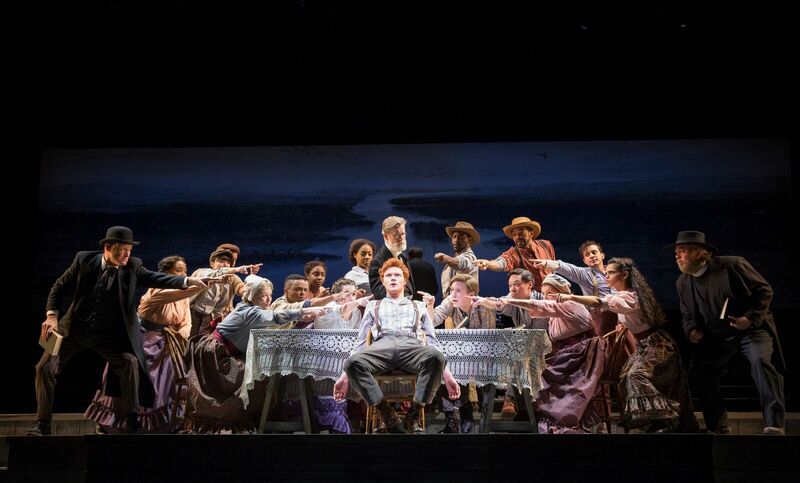 Big River is a musical ripe with potential scene stealers. And they certainly found a place here. Charlie Franklin as Tom Sawyer brings charisma and charm as the little troublemaker. The vibrancy and playful mischief worked well against Barasch’s Huck. Similarly, David Pittu as The King and Christopher Sieber as The Duke won the crowd scene after scene, song after song. As the resident clowns in the company, Pittu and Sieber make comedy look second nature. While Mary Jane Wilkes is merely a blip in the story, Lauren Worsham was radiant. Like Worsham, Cass Morgan and Annie Golden took on some minor roles but worked their magic, reminding us why they are theater royalty. Big River, to some, may be a misunderstood big musical. Between a beautiful score and a classic story, Big River will shine on within the canon of musical theater. New York City Center has done an extraordinary job celebrating this work. If you missed it, cross your fingers there’s a chance for another life.